Very sadly, not anymore... Very sad to say Henry and his Old Parts Sale passed on to that Great Boneyard in the Sky in June of 2017. 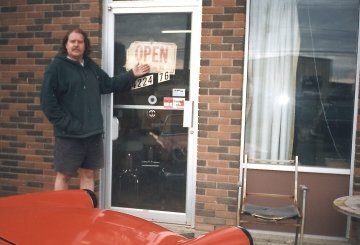 Some of you may know Henry from his days at British Motor Group (BMG) in one of its incarnations, or from Hawkins Auto Service, or Euro Auto Parts, or just around the old British auto scene in Edmonton, Alberta. The picture shows Henry at the second incarnation of BMG, which is where I met him in 1997 when I stumbled upon his shop and eventually bought the 1962 Sunbeam Alpine with its snout in the foreground. I knew Henry until just before his passing, 20 years later. Henry was a wacky guy, but he leaves behind 2 fine upstanding citizens in his children, and at least 3 grandkids. You can contact the family here.